I saw the WEE Band MV in you tube and was very curious about the WEE Project they promoted, so I looked around and found some explanation. Please credit this properly if you want to repost the infos ya ! Cos it took me some time to research this ...so glad I understand about WEE project now. Education welfare that considers the needs of every single student. Education welfare for all consist of Pre-school youths, Students with disability, Less-privileged students and Student in crisis situations. For drop-out students and other students in need of professional guidance, the ministry will expand the ‘We Education Emotion(WEE) Program’ to 2,530 WEE classes(making friends), 130 WEE centers(student life support) and six WEE schools(long-term consigned education). For the estimated 3,300 students that are situated in crisis situations such as victims of family violence and unmarried mothers, ‘Wee Homes’ will be operated for guidance and protection. Remember I told you Jang Keun suk had some similarities to Bae Yong Joon ?...yep, here's what I meant....Like Yong Joon ssi, he is also involved in supporting governmental projects and has been appointed ambassador and spokesman by several organizations. I read that In July , the Ministry of Education, Science and Technology had named actors Choi Ran, Jang Keun-suk, Park Hae-jin, Eric, and singer Jang Yoon-jung as spokesmodels for the academic credit bank system. Read around some more and found out that Jang Keun Suk was also appointed by KTO as the publicity ambassador for the city of Seoul, helping promote Korea’s tourism as a celebrity supporter for the “2010-2012 Visit Korea” campaign. 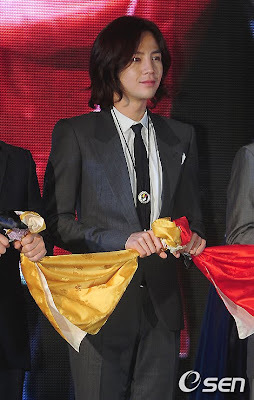 Keun Suk attended the “Inspiring Night in Korea” event organized by Korea Tourism Organization (KTO), and was one of the five people who were selected for the campaign and received a pendant from Korea’s First Lady Kim Yoon-ok at the ceremony.